Rina Aiuchi is a female Japanese popular music singer. She writes her own lyrics to her songs and now self-produces. She is currently affiliated with the Giza Studio recording label. As a child, Rina enjoyed singing for others, and put on shows for her mother. At the age of 5, she began musical training on the piano, becoming the class pianist for her kindergarten class and elementary school. Rina made her debut on 2000, with the release of the single, "Close To Your Heart". She released three more singles that year, and her title "Koi wa Thrill, Shock, Suspense (恋はスリル、ショック、サスペンス, Koi wa Thrill, Shock, Suspense)" was used as an opening theme for the anime series Detective Conan, and made a great hit for the first time in her career. In 2001, Rina's first album, "Be Happy", that includes "Koi wa Thrill, Shock, Suspense", was released. Since then, she came to appear on TV, and became very popular in Japan. In 2002, Rina's second album "POWER OF WORDS" was released, and it is the most popular album in her work. "POWER OF WORDS" reached the top of the Oricon charts and sold over 540,000 copies. Her 3rd Album "A.I.R." did the same, reaching the #1 spot in the Oricon charts again. Her singles have since been used in other anime series, as well as video games. "MIRACLE" was used for the 5th ending theme of MAR and "Bara ga Saku, Bara ga Chiru" was used for the opening theme of Souten no Ken. 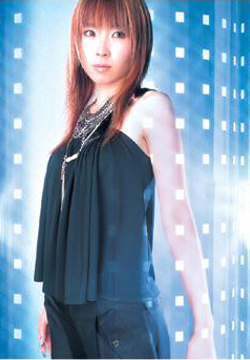 Her song, "CODE CRUSH", was chosen to be the opening theme to Capcom's Rockman X7, helping her single "Over Shine" and her 3rd album gain popularity in 2003. Also, with the hit of her 13th single (and one of her most famous tune) "FULL JUMP", she was invited to perform on the stage of "NHK Kōhaku Uta Gassen", the biggest concert event in Japan. Her popularity has been stable ever since, earning her 4th Album "PLAYGIRL" and 5th Album "DELIGHT" constant success. In 2008 was release her 6th Album "TRIP", two years after "DELIGHT". Once again, the album reached the Top 10 in the Oricom chart. Rina is known for her wide voice range when singing, but her speaking voice is high pitched.